The Chennai-based ANOVA Corporate Services headed by Mr. Chandrashekar Kupperi, won the First place under ‘SME Services’ category during the prestigious ‘13th National Award for Excellence in Cost Management, 2015’. The award was presented in Delhi by Mr. Najib Shah, Chairman of Central Board of Excise and Customs. The award has been given to ANOVA for its value-added services to senior management, company boards, and owners of small and medium sized companies (SMEs). ANOVA’s business offerings include Mergers & Acquisitions (M&A) which encompasses Financial Due Diligence, Valuation, Financial Modelling, Fund Raising, and related Advisory Services, besides Financial BPO Services. Mr. Chandrashekar Kupperi (exterme left), Director, ANOVA Corporate Services receives the award from Mr. Najib Shah (2nd from right), Chairman of Central Board of Excise and Customs. 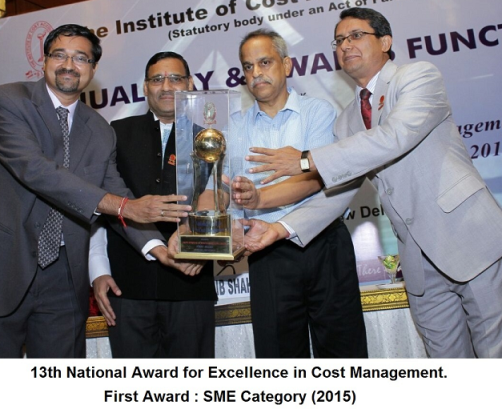 The Institute of Cost Accountants of India, a statutory body under an Act of Parliament, presents awards for excellence in Cost Management to promote and recognize Cost Management practices in the Corporate Sector. The awards under various categories were selected by a Jury panel headed by Hon’ble Justice Mr. V. N. Khare, former Chief Justice of India and persons of eminence from Industry, Government, Judiciary and CMA profession.